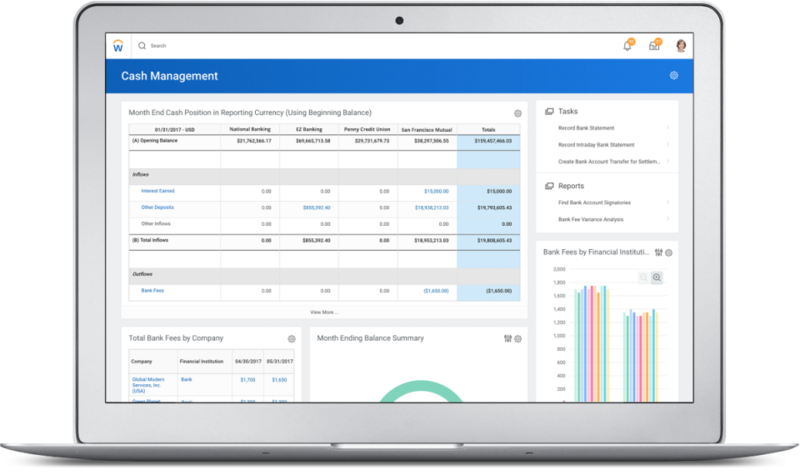 Manage your organization's financial accounting, reporting, procurement, revenue, inventory, and projects in a single system. 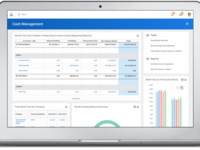 Workday Financial Management Reviews Recently Reviewed! 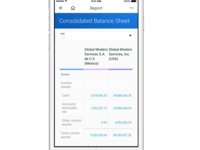 Pros: Workday Financials is user friendly and has some great reporting capabilities. The interface looks fresh and it's easy to navigate. Each new release adds additional utility. The Workday Community is a great tool to post ideas and get real world advice from other companies experiencing the same issues. Cons: Workday runs slow sometimes, especially on days when we're loading payroll and there's a lot of data going through the system. Sometimes Workday gives cryptic and seemingly random error messages. 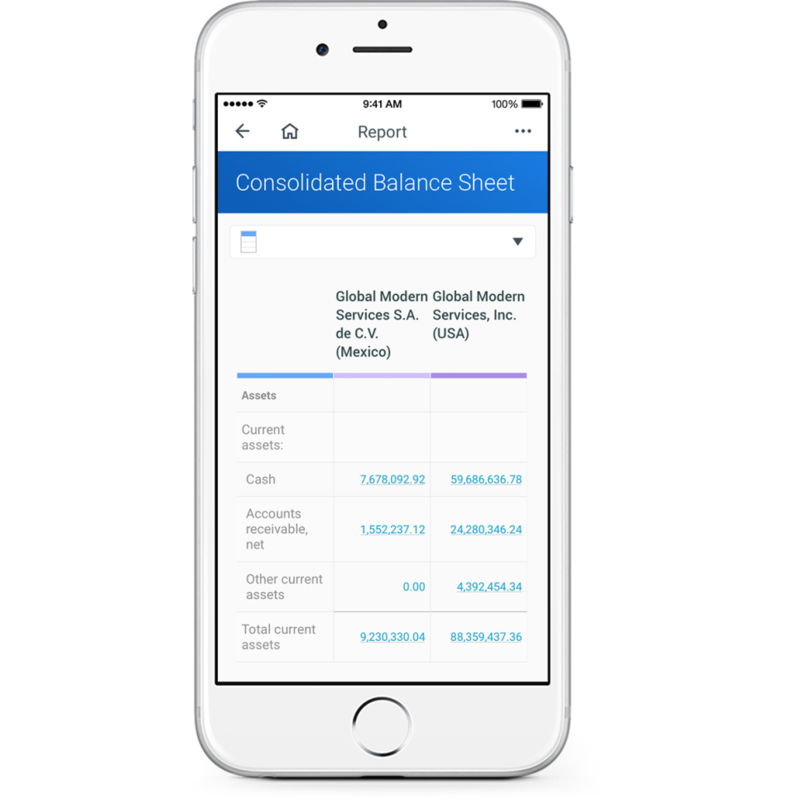 Overall: Workday Financials gave us much needed reporting capabilities that we weren't getting from other software. 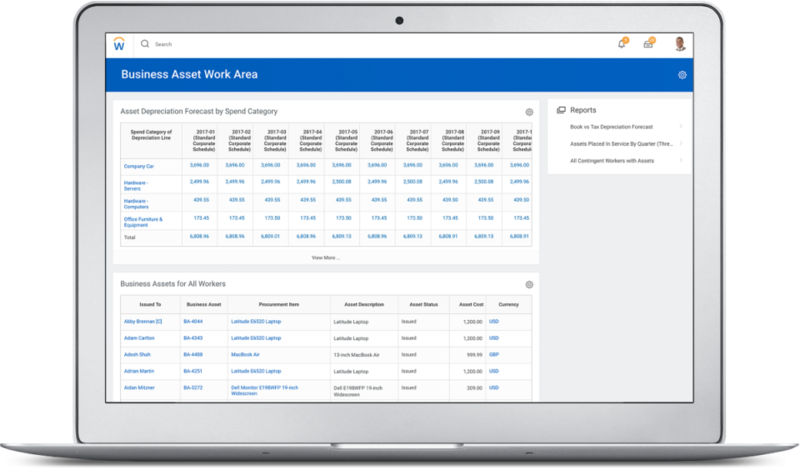 The fact that it integrates with our HRM system makes it easier to drill into certain data sets. Adding attachments to invoices and journal entries has essentially turned us into a paperless office. Pros: The reporting capabilities and the ability to drill down in functions to get to the info you need. Cons: Not always user friendly. The error notes are not very helpful in pointing you to the specific line that has an issue. Overall: When we initially started using this product it was very cumbersome. It improved some of our old processes but then seemed to make other worse. It has either gotten better or we have just gotten use to it. We have also had some issues with invoices getting lost in the system and had to recreate them in order to get them to process. They recently changed the requisition creation and it is not clear what the end user needs to do once they enter a line item. Overall I like the product but I feel it could still be improved. We just started using the HR function this week and so far I like what I see. Customize reports needs to enhance. It is a little bit difficult to use at the beginning. Pros: It has a very simple interface. Reports and features can get customized by ITS on demand. There is an app you can use on your phone with all the working features. Cons: It contains no tools for project management other than the accounting of available budget, obligations and actuals. Some terms do not reflect the correct accounting, finance, and projext management industries. Pros: GUI interface.Easy to use...and user friendly. I am using this from past 2 years and its awsome tool. Cons: The charts can be improved , taking out the reports is not not so easy and can be improved further. Excellent, I can have all the analysis of my management in a single financial management system. Pros: I like most is that it gives me the possibility of having all the analysis of my management in a single financial management system. I find it interesting that it helps me to lead strategic planning and find the best ways for the profitability of my new business. Cons: I'm practically new using the tool, but I think it would be useful to include the possibility of including the initial data of the company and predict its productivity in the short term. 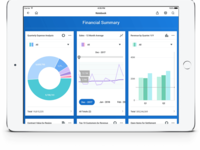 Overall: Allows me to register new levels of financial efficiency and business performance with Workday accounting software, I could quickly respond to anomalies as they happen with reports and in-memory accounting, I could manage all activity with configurable business processes. A great benefit is that I have accomplished to change proactively to internal and external changes without IT resources or costly customizations. Pros: I like being able to access my personal information, my performance, my time, my benefits, etc. all in one location. Cons: I don't like how difficult it is to track my time. We have a lock out every week and it is difficult to keep track of the hours I work. I usually have to write them down on a sticky note and transfer them back in once the lock out is over. Very inconvenient. I also don't like how I have to go to a different screen to include my absences like PTO or Maternity leave. It's been somewhat of a mess trying to keep track of al my hours and benefits. Overall: I use workday to keep track of all my important company information. Overall I would say it's a good platform, but it needs some updating to make it more user friendly. Epically the time and absence widgets. I'm not a huge fan of how this program functions. It is good experience of working with this tool. Pros: Very user friendly interface. easy to operate and reports can be taken out very easily. Used to of this tool is about 3 years. Cons: It is good tool however recovery of reports by this tools sometime seems difficult and need to improve its efficacy and speedy data and report production. Pros: I like the easy access to different reports. I can put down information the way I want it and dive deeper into the data if I need to. Everything is linked and stored in an easy to navigate format so you will have an easy time looking for what you need. Cons: I don't like that reports can take a while if the data size is fairly large. Also if you attempt to click around too much before Workday process what you want it to do, you will get an error message. It is very easy to create this error message if you click around too much without giving it some time. 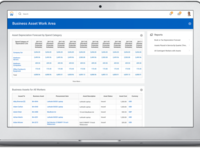 Pros: Workday enables businesses to view all their financials in just a few clicks. Cons: Usually when a report is exported to excel, it's hard to view since the columns contain information that are irrelevant and need to be hidden. Overall: My overall experience with Workday is sometimes frustrating since I cannot get the reports I need to do my job. I work with the filing of 1099s for all the vendors and it's impossible to run reports with the information I need in order to report accurately to the IRS. 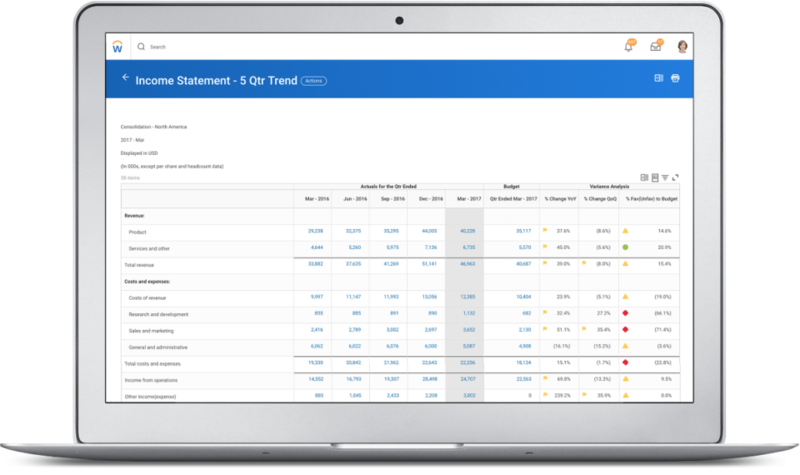 Pros: I love how Workday is my company's one stop shop for all things HR. It's easy to be able to log in and have all the important things in one place. We do our annual reviews here, our employee information is tracked here, and our training services are done through here. Prior to Workday, we used many different platforms - now we just have this one. Cons: I find the platform can be slow, and the user interface is not very compatible with Internet Explorer. Overall: Overall I am happy with my experience using Workday. I love being able to go to one place for all my HR needs. Pros: Workday is an easy to use time management software. 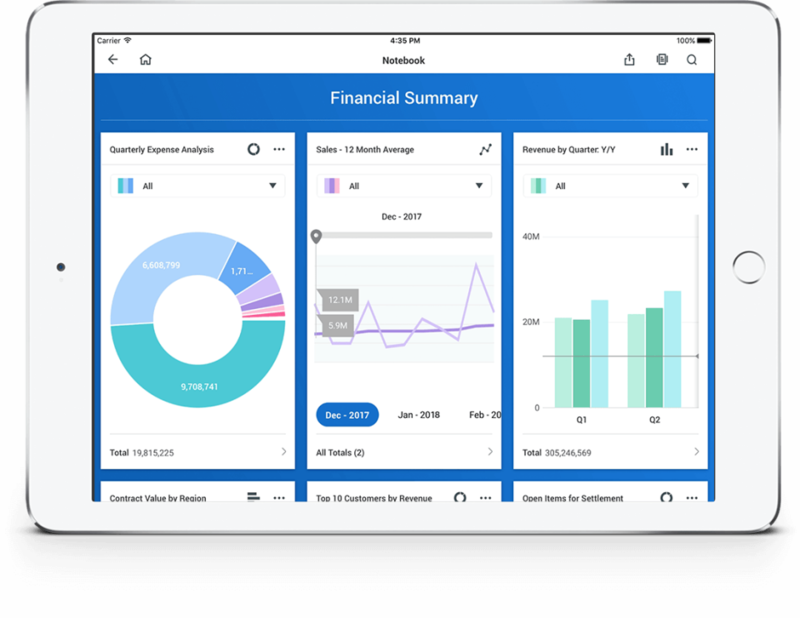 Unlike a lot of internal time management software Workday can be used through their app on your phone. It is convenient if something comes up and you need to make an adjuster to you work schedule on the run. Comments: Great for jobs where you are scheduling a variety of users. Pros: Workday is highly effective and easy to use. It is streamlined and user friendly. It's a very straightforward accounting software program. Cons: You have to find a specific link for your company, and it can be difficult to find. That's the only issue. Pros: it does the job at the end of the day and you can structure the tabs easily. Cons: The look is very much aged and basic. A bit of a face lift would help the user experience. Comments: It has been a pleasant transition thus far. There are a few hiccups when entering information. I feel the navigating is a bit choppy however it is so new I am not going to make a strong opinion just yet. Our employer is giving us this in small doses and most of the headache is just establishing processes as some duties have shifted. Over all a great product!! Pros: User of Workday, this could not be an easier way for a non stop shop for payroll/tax info, managing benefits and my calendar with time off. Cons: Only con that I do not understand is in the iOS app every time you need to view your actual pay stub you need to 'generate' a PDF which takes ~5 seconds. Comments: It is never easy changing systems but Workday is much easier to use then our previous system. Workday has been very user friendly. I haven't had any problems using this system. 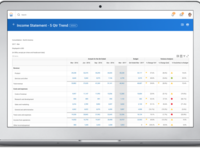 One tool to provide all finance related detail. Comments: It provides complete transnational efficiency and control. Very good tool for accounting, consolidation, planning, procurement, projects, reporting, and analytics. Comments: I find it easy to use and navigate through. We are just getting some of the new features so I am not sure about it as a whole package yet, but so far, the accounting piece is very good.